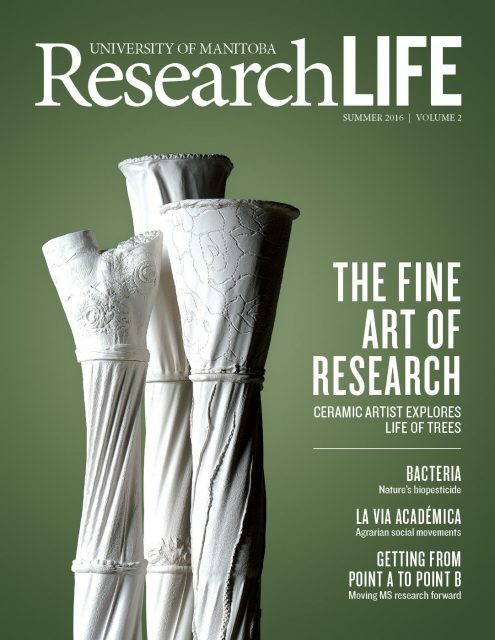 The summer 2016 issue of the University of Manitoba’s ResearchLIFE magazine has an insightful article about my installation, Arbor Vitae . Thank you to Mariianne Mays Wiebe for her thoughtful writing and Janine Harasymchuk for the beautiful design! Each individual module began with careful planning through experimentation in an intricate fabric modelling process and making complex plaster moulds, done in advance of the casting and firing of individual pieces. The fabric-formed modelling process also accounts for the deceptively soft look of the porcelain tree-column’s draping effects. —Mariianne Mays Wiebe, “Trees for the Forest,” in University of Manitoba ResearchLIFE (summer 2016): cover, 2, 18–21. PDF (2.2 MB).